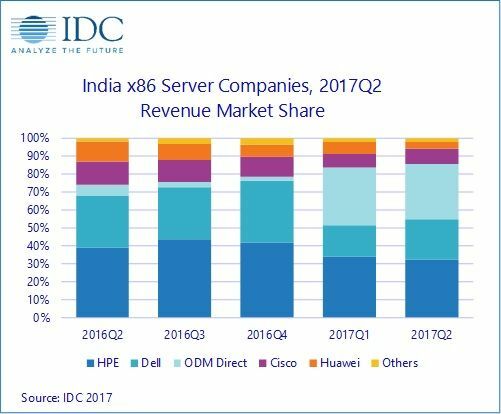 NEW DELHI, September 27th, 2017 - The overall server market in India witnessed a year-over-year (YOY) increase of 60 percent in terms of revenue to reach $304.6 million in Q2 2017 versus $190.4 million in Q2 2016, according to the latest IDC Asia Pacific excluding Japan (APEJ) Quarterly Server Tracker, Q2 2017. The x86 server market accounted for 91.1 percent of the overall server revenue during Q2 2017, with growth being majorly driven by spending from captive and outsourced data centers and public cloud service providers. During Q2 2017, the market witnessed a growth in non-x86 market, after continuous revenue decline for two quarters. However, it’s interesting to see, the reciprocation from the non-x86 platform providers towards increasing x86 market, which is gaining traction from end-users for deploying applications and workloads on x86 platforms. The x86 server market in terms of revenue witnessed a YOY growth of 67.6 percent to reach $277.5 million in Q2 2017 up from $165.6 million during Q2 2016. The major demand of third party datacenters comes from the Banking, Financial Services and Insurance (BFSI) sector. Apart from these traditional sectors, third party data centers are also witnessing demands from Government projects and their digitalization efforts. Rack and Density optimized servers that are mostly preferred for running IT and digital transformation workloads, gained traction, accounting together for YOY growth of 70.1 percent, in terms of revenue for Q2 2017 compared to Q2 2016. The non x86 server market grew by 9.3 percent YOY in terms of revenue to reach $27.1 million in Q2 2017. In terms of revenue, HPE leads the market, accounting for 38.9 percent of market share, followed closely by IBM with its share of 36.7 percent during Q2 2017. In non x86 server market, banking industry continues to dominate and contributes for 65.1 percent of the revenue, followed by utility, manufacturing, telecommunication and professional services verticals. “Professional services, telecommunication and manufacturing contributed for more than 75 percent of the overall server shipped during Q2 2017. Digital initiatives, datacenter expansion and ODMs penetration, continue to impact the server market in India,” adds Rishu Sharma, Associate Manager, Enterprise Infrastructure, IDC India. In India x86 market, HPE leads the India server market with 30.8 percent in Q2 2017, as revenue increased by 48.9 percent YOY to $85.5 million. The major deals for HPE came from telecommunications and professional services verticals. Dell successfully increased its market share to 21.4 percent during Q2 2017, while Cisco accounted for 8.0 percent of market share winning deals across various verticals. ODM direct continue their accelerated growth, addressing the demand of underserved Indian Data center market. "ODMs growth continues for the second consecutive quarter of the year, owing to the fact supporting the expansion of outsourced DC service providers. Many captive data centers are already planned up for the coming year and we expect to see strong competition between ODMs, supporting the public cloud growth of Indian market,” says Harshal Udatewar, Server Market Analyst, IDC India. Third platform technologies have made many end-users rethink their data centre strategies and is the major driver behind the infrastructure demand in India. Digitalization is reaching the mainstream in banking, professional services and Government verticals whereas telco’s spending is focussed towards improving customer experience management and the launch of VoLTE across India. The India server market looks favourable from compute point of view as we see major users of data centres such as BFSI, telecom, IT and ITeS, and Government showing remarkable growth opportunities in India.